…an Open Source solution for controlling Flash via Wiimote(s). The site’s been up a few weeks, and you may have seen some of the videos if you are on the Papervision3D list, but I just realised I’d not announced it to the wider community. Currently there is a very first beta available for download from the site (although it works fine the solution is kinda clunky and Windows only), and a couple of quick tutorials on getting it all up and running. If you have a Wiimote and fancy a play feel free to grab the files and let me know what you think. 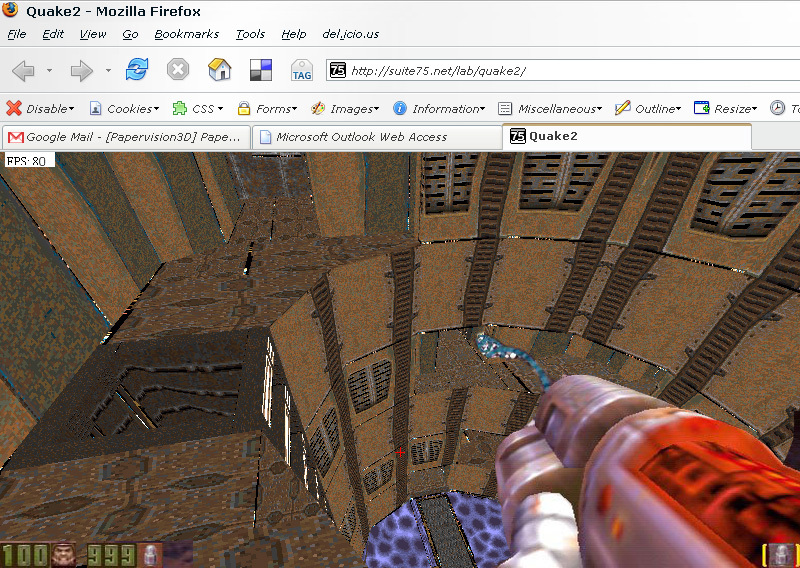 So it’s not quite (err, at all…) playable yet, and I may have done a little photoshoppery on the screenshot above but still… a Quake2 map & textures loaded, parsed and running in the Flash player via Papervision from Tim Knip, very cool indeed… aaah the good old days!